Rohingya Muslims use their cellphones as they sit on a hillock overlooking Balukhali refugee camp, in Bangladesh, Nov. 14, 2018. Amnesty says the organized return of the Rohingya, slated to start as soon as November 15, is a "reckless move, which puts lives at risk." Amnesty's East and Southeast Asia Director Nicholas Bequelin said, "These women, men and children would be sent back into the Myanmar military's grasp with no protection guarantees, to live alongside those who torched their homes and whose bullets they fled." 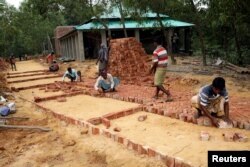 Workers build a Rohingya repatriation center in Gunndum near Cox's Bazar, Bangladesh, Nov. 14, 2018. Bangladesh has announced it is ready to start repatriating some of the more than 700,000 Rohingya who have fled to Bangladesh since August 2017. They fled to escape a crackdown by the Myanmar military in response to a series of attacks committed by Rohingya militants. Myanmar, too, has announced it is ready to welcome the Rohingya back. But U.N. human rights commissioner Michelle Bachelet has voiced her concern about the safety of those who return to Rakhine state, and Amnesty said it is unclear whether the people Bangladesh is planning to repatriate have consented to the move. Bangladesh has said that only refugees who say they want to return to Myanmar will be repatriated. Earlier Wednesday, U.S. Vice President Mike Pence openly rebuked Myanmar's leader Aung San Suu Kyi for Myanmar's treatment of Rohingya, during a face-to-face meeting on the sidelines of the annual Association of Southeast Asian Nations summit in Singapore. A special U.N. fact-finding mission said the military acted "with genocidal intent" against the Rohingyas, citing numerous atrocities such as extrajudicial killings, gang rapes and the torching of entire villages. Myanmar's State Counselor Aung San Suu Kyi and U.S. Vice President Mike Pence hold a bilateral meeting in Singapore, Nov. 14, 2018. The U.S. vice president said the "violence and persecution" against the Rohingya "is without excuse." Pence also urged Aung San Suu Kyi to pardon two Reuters journalists who were convicted and sentenced in September of violating Myanmar's colonial-era Official Secrets Act. Wa Lone and Kyaw Soe Oo were arrested last December after meeting with two police officers at a restaurant in Yangon and being given a stack of documents. They were investigating the massacre of 10 Rohingya by police and soldiers in the village of Inn Din last year. Pence said he was eager to discuss with Aung San Suu Kyi the importance of ensuring a "free and independent press" in Myanmar. In response, Aung San Suu Kyi said her government is "in a better position to explain to you what is happening and how we see things panning out."